When we visit a new city, general tendency is to book a taxi to take us around. Many of us simply ignore the public transportation, simply because we don’t want to put an effort to understand the public transportation systems and options, or we simply assume they are not going to be convenient/practical. We go ahead and book taxies, that cost several thousand rupees a day + parking + toll+ entry fee etc. Your travel agent is also not likely to advise public transportation, because he/she gets to earn some commission if you book a cab through them. They get nothing if you use bus or metro. But it majority of the cities, with some planning and research, it is possible to use public transportation to visit various tourist destinations and save lots of money which is otherwise spent on taxi. Using public transportation also helps us gain better knowledge of city’s layout, people and culture. Sitting in a cab we won’t have a clue about direction/orientation etc. During our recent 4D/3N Kolkata trip, we explored most of Kolkata using trams, buses, metro, trains and a fair bit of walking. We hired taxi only on 3 occasions. 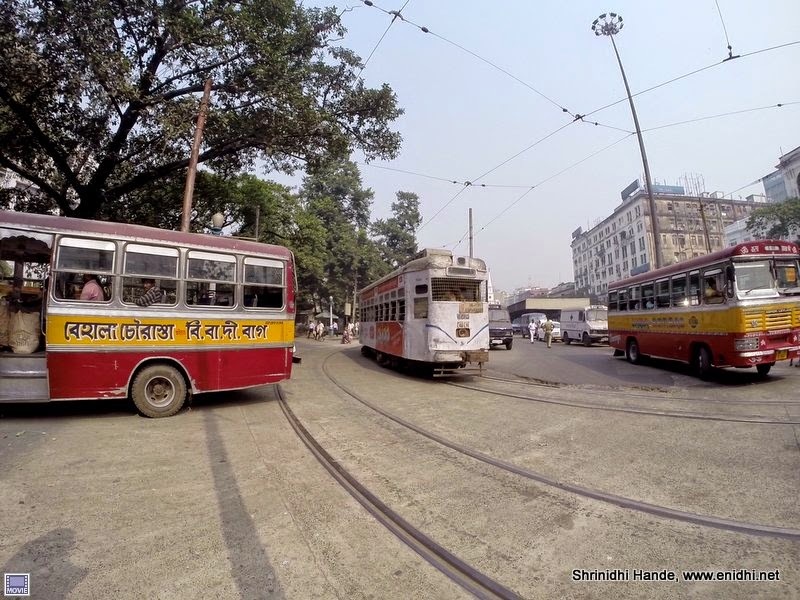 In this post, I am explaining how we covered Kolkata using public transport, so that it can be of use when you plan to visit Kolkata. Step 1: Book a hotel within walkable distance from a metro station, somewhere around Esplanade or Chandni chowk or surrounding area. Esplanade is kind of central area and is very close to several places of tourist interest. Staying around this place will ensure easy connectivity to all places. Step 3: Where possible ensure that your arrival and departure is during day time (between 6AM to 10PM)- late in the night you may not get public transport to/from airport, you may have to hire taxi only. Note: This post assumes you’re group has healthy people who are fine with fair amount of walking/traveling in public transportation. If you have elderly people, kids or folks who are allergic to crowded bus/train or those who can’t walk even half a kilo meter at a stretch, then these ideas may not work for you. Go give some business to taxi fellow. From airport, you can take AC bus to Esplanade area (Rs 45 per person) Or take a taxi/bus till Dum Dum station and take metro from there. Once at hotel drop your luggage, refresh and step out with camera bag/minimum stuff to explore the city. Below is an indicative itinerary, feel free to tweak it as per your convenience, preference, arrival/departure timing etc. Ask me if you need help. Day 1: Either take a metro to Maidan station or simply walk down. From here, you can explore Victoria memorial, Indian Museum, Birla Planetarium (these are pretty close and will take about half an hour. Keep in mind show timings of Birla Planetarium. These 3 places will easily take half a day, assuming you start at around 9 AM. Once at babu ghat, Esplanade is just a few kms by walk. If it is after 7PM, you can continue in bus no 55 till esplanade. Once done with Birla mandir, either take a bus or share auto back to Jatin Das Metro area. (Share auto was Rs 7 per person). Take Metro to Esplanade. Take a bus to Salt Lake city. Once in Salt lake city, you can explore Salt lake city stadium and central park. (take share auto). Salt lake city is a better planned township and is more clean and well designed than rest of Kolkata. Day 3: One day you can spend visiting places outside Kolkata city. You can either take a one day tour to Sundarbans (Rs 3000 per person in case of 3 or more people, Rs 4500 otherwise) for a package tour [More details in this post]. Alternatively you can take a train to Bishnupur [More details on Bishnupur visit here], where you can explore ancient terracotta structures for half a day and return to Kolkata by night. This way you get to experience west Bengal country side also and not just Kolkata city. Day 4: Depending on your interest, you can either spend time shopping in various shopping areas in the city, or explore few other interesting places- Shahid Minar (behind Esplanade private bus stand), Marble Palace (walkable from MG Road Metro station), try some more tram journey etc. Few other possible places are Belur Math shrine, Dakshineshwar Temple (We couldn’t visit them, so can’t advise on route and time) Depending on your flight time, you can explore some more places or take a bus/metro to airport. Return to airport by bus from Esplanade or take metro till Dum Dum and from there take a bus/taxi. Note that some non-ac buses do not go right up to airport- they stop at a place 2kms from airport. So you have to walk the last few kms or take another bus (A/C bus) or taxi etc to reach the airport. As I said earlier, we took taxi only 3 times during our 4D/3N Kolkata visit- once from Birla Planetarium to Botanical Garden (Rs 150) because bus would take too much time), second from hotel to Santragachi railway station at 5.30 AM for Rs 220 (as no other option was available to catch our 6.25 AM rupasi bangla express to Bishnupur..) and one last time from Chandni chowk to Writers block for Rs 50, as we were running out of time and wanted to check few more places before leaving for airport. That is a total of Rs 420 for 4 days spent on taxi. Rest of the places were visited by foot, by tram, bus or metro, including journey to and from airport. We probably spent about another Rs 300-400 on public transportation during our 4 day stay. If you were to take a taxi for everything, easily the total expense could have reached Rs 3000-4000 for 4 days (Assuming that you’d hail a taxi for about 10 rides a day with an average spend of Rs 100 per ride- An 8 hour/80 km package also usually costs about Rs 1000). We did spend some extra time walking, figuring out where to get a bus, which bus to board, waiting for the bus/metro etc. But the additional time spent because of public transport wasn’t significantly huge and was certainly worth the savings. Fair amount of walking is also good for health. Metro is more faster than taxi during peak hours. However, be mindful of the risk- buses and trams could be crowded. If you have expensive stuff like cameras and mobiles, you should be extra careful. Similar to Kolkata, it is possible to explore many other cities without renting a taxi. I will try to write about few of them in future posts. When travelling I love to walk around and use the public transports, it gives you a better picture of the actual culture of that place. Agreed totally that public transports are not for the faint hearted.